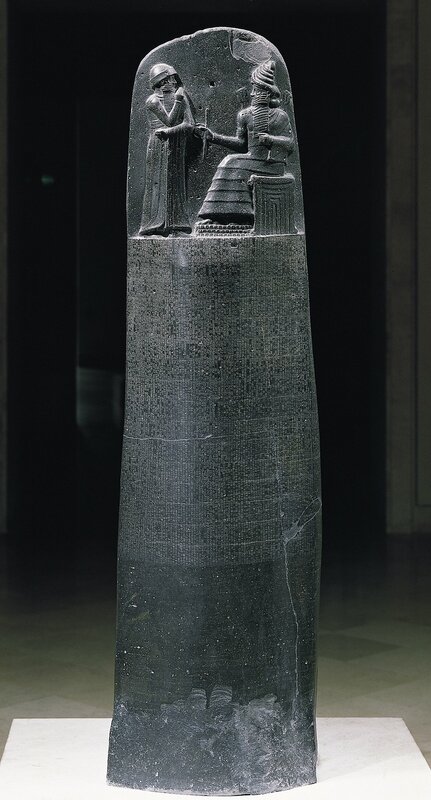 Stele, made of diorite, containing Hammurabi's Laws. Image online, courtesy Wikimedia Commons. The original artifact is maintained at the Louvre, in Paris. In about 1780 B.C., at the height of his power, Hammurabi codified 282 laws on an eight-foot-high stele made of black basalt. Although the Code of Hammurabi is not the first legal code, it is the best preserved ancient law the world has today. Using 51 columns of cuneiform script, Hammurabi's stele is engraved in the Babylonian language of Akkadian. It originally stood in Babylon's temple of Marduk. At the top of the stele is Hammurabi, standing on a sacred mountain before Shamash, the sun god and patron of law and justice. Hammurabi's right hand is raised in front of his face, in prayer. Note the flames (of the sun) on the shoulders of Shamash as he gives Hammurabi the laws. Hammurabi's Laws codify prior Sumerian traditions. The Code is notable for enlightened laws that exist side by side with barbarous punishments. Aside from the well-known "eye for an eye" (law 196) and "tooth for a tooth" (law 200), the Code includes other pronouncements (like whoever builds a shoddy house will be put to death). At the same time, Hammurabi includes judicial procedures where a man's oath is everything (even when it is ultimately proven to be false). While several web locations contain Hammurabi's Code, Yale Law School provides the best site. You can read the laws and the definitions (of unfamiliar words) on the same page. Bos, Carole "HAMMURABI'S LAWS" AwesomeStories.com. Oct 01, 1999. Apr 18, 2019.